Biotechnology has a very important role in increasing agricultural productivity; In the health sector, through the production of new medication, vaccines and diagnostic kits; and in energy, increasing the production of biofuels. In the strategic development plan of the State, Biotechnology and Life Sciences are a priority. Minas Gerais has six incubators and three accelerators, as well as three hubs and three technological parks carrying out synergic activities in the life sciences sector. Minas Gerais is considered one of the main life sciences hubs in Brazil, driven by the excellence of the science and technology institutions in the state. The map below shows the distribution of institutions funding life sciences in the state. This sector benefits from public policies that stimulate growth and competitiveness of the technological industry. The 2008 State Innovation Law and the creation of the Minas Gerais Innovation System (SIMI) intend to promote the convergence of cooperation of various players in developing innovation in the State, as well as the Minas Gerais Innovation Incentive Program (PII). Minas Gerais also has a program supporting startups, known as “Startups and Entrepreneurship Ecosystem Development” (SEED), providing capital, training and space for coworking to the selected entrepreneurs; and, more recently, the BioStartup Lab, a program for the acceleration of ideas and projects focused on life sciences areas. The Greater Belo Horizonte Region is considered the largest biotechnology cluster in Brazil, competitively operating in the Latin American market and other international markets in human health, animal health, environment and agribusiness. automation and medical device equipment. 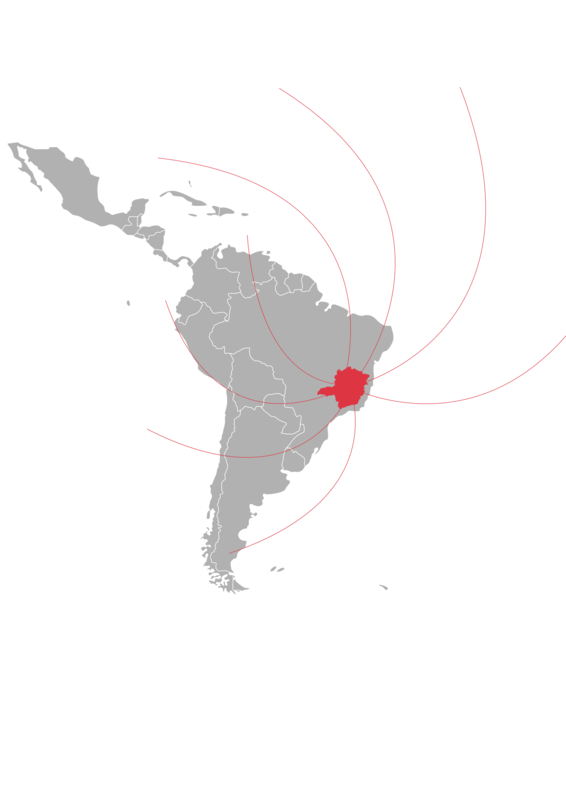 The Biotechnology Clusters in Minas Gerais are internationally recognized because of the large number of companies gathered in various regions – from the producers of final goods and services through to the suppliers of inputs, equipment manufacturers, providers of biotechnology consultation and services. Currently, Minas Gerais is a highlight in the biotechnology sector, with three important hubs: Viçosa, Triângulo Mineiro and Greater Belo Horizonte (RMBH). The main area of operation is Human Health (44,8%), as a result of the historical tradition in scientific and technological production in the State, focusing in diagnostics and other medical solutions. On the other hand, local biotechnology companies also work on developing agribusiness solutions, mainly in animal health, such as reproduction, molecular diagnosis and the production of vaccines (Biominas Brasil, 2014). Considering the health products subsector, Minas Gerais has over 400 technology and innovation companies working in human health, animal health, the environment and agribusiness. The main applications of biotechnology in the pharmaceutical industry are: i) support to pharmaceutical research and development (R&D) in general; ii) development and production of biopharmaceuticals; iii) development and production of diagnostic kits and reagents; iv) development and production of vaccines; v) gene therapy; and vi) cell therapy or organ and tissue replacement therapy (BNDES Setorial, 2009). Minas Gerais has scientific and technological institutions that are references in animal and plant improvement. Embrapa and Epamig are references in the protection of cultivars. Both have collaboration agreements with Minas Gerais universities, such as UFLA, UFV and UFU. UFV has projects in Plant Science for genetic improvement in agriculture. In Uberaba, there is the Excellence Hub in Bovine Genetics in the headquarters of the Brazilian Association of Zebu Breeders (ABCZ), created in 2009 by the Science, Technology and Higher Education Secretariat of Minas Gerais (SECTES), with the objective of promoting genetic improvement in Minas Gerais. Public investments in the production and technological development park made the State of Minas Gerais one of the most innovative regions in Latin America. Public initiatives of the state and federal agencies, such as the Minas Gerais Development Bank (BDMG), BNDES, Finep and Fapemig have contributed with funds for priority areas of the government. BDMG is involved in various actions to fund innovation activities and is a shareholder in Criatec II and III funds. The graph below shows the participation of different agencies in the funding of biotechnology projects. The Minas Gerais bioscience companies, according to the number of employees, are shown below. Many of them (43.3%) have up to 10 employees and the Research and Development (R&D) teams are made up, usually, of 5 people. 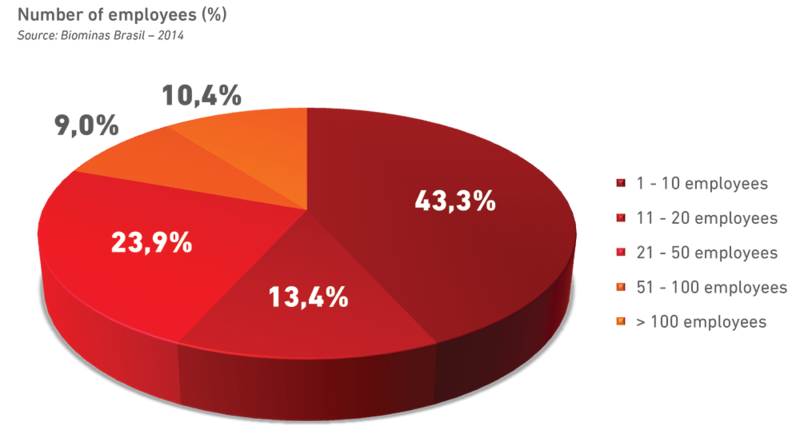 On the other hand, 57.2% of the companies with over 100 employees have up to 10 R&D workers (Biominas Brasil, 2014). The cooperation between companies, universities, research institutions and centers is essential to the development of the biotechnology sector. The objective of the partnerships is the co-development of products and processes by sharing the use of the infrastructure of these institutions (laboratories and equipment). The cooperation between companies, universities, research institutions and centers is essential to the development biotechnology sector. The objective of the partnerships is the co-development of products and processes by sharing the use of the infrastructure of these institutions (laboratories and equipment).